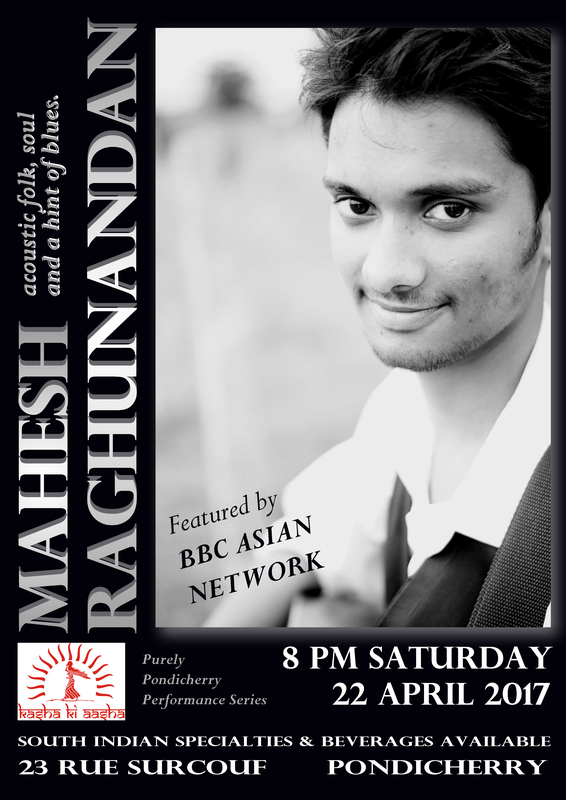 Mahesh Raghunandan will be gracing our terrace this week at 8 pm on Saturday evening. Mahesh is a singer-songwriter and musician from Bangalore whose music combines indie folk, folk rock, pop rock and soul along with a hint of blues. Influenced by artists ranging from Ray Charles, Stevie Wonder, Frank Sinatra all the way to John Mayer, Damien Rice, Mahesh has opened for artists such as The Raghu Dixit Project, Bruce Lee Mani (Thermal and a Quarter), Parvaaz, The Kutle Khan Project, Sanjeev Thomas & Baiju Dharmajan and international artists such as Lucy Rose, Luke Sital-Singh from the U.K and Ty Penshorn from Australia. Mahesh also performed a singer-songwriter set at The Bacardi NH7 Weekender Bengaluru Edition in December 2015 and the Stage42 Festival that featured renowned international and national artists such as Mark Ronson, Boyce Avenue, Noori, AR Rahman and more. He has performed with Christian Galvez, one of the best Jazz musicians in the world. Besides the solo career, Mahesh is involved in multiple collaborative projects. He was also the front man the Indie-Rock band “Mahesh and the Mix” which is now defunct. So see you Saturday evening at 8 pm for another Purely Pondicherry Performance! First come, first serve! ← Pani Puri & Jazz? Purely Pondicherry!